Meet Chloe. Chloe is a wearable Hybrid Mesh Head from LOGO that works with your SL body (shape) and all existing clothes and hair. I had the pleasure of seeing the work-in-progress of Chloe months ago, but I couldn’t show you guys until the official release. 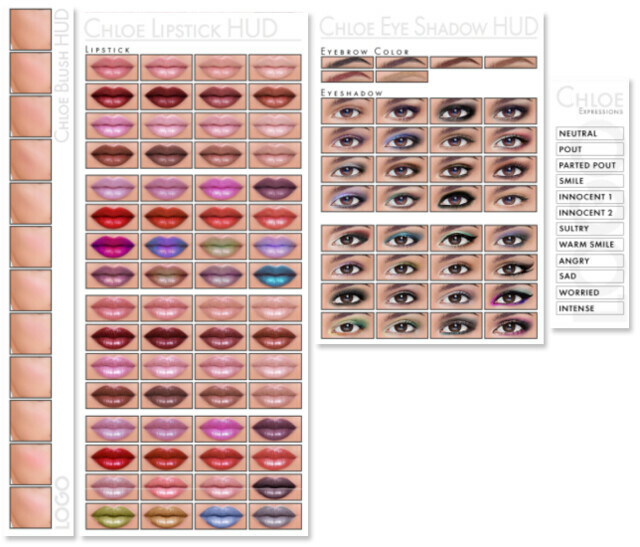 Finally, Chloe is here, and I am officially declaring my love for this hybrid mesh head!! I’ve seen a few mesh heads in SL before from other brands, but none as beautiful and detailed as Chloe. Look at this amazing Makeup HUD! I’m very excited about this HUD, and I loved that it’s packed with so many options! As you can see, the HUD is scripted to change Lipstick, Eyeshadow, Blush, Nose Style, Eyebrow Color, Eyelashes, and facial Expressions!! I had so much fun playing with the facial expressions, it is my favorite thing about the mesh head. I loooooooove these 16 Facial Expressions! What I really love, is that the eyelashes moves with each face, so I didn’t need to re-adjust them at all. The scripting for this HUD is flawless, and so easy (and fun!) to use. Like many people, I’m pretty attached to my own shape and face that I’ve been tweaking for years. However, I view the Chloe Hybrid Mesh Head as a very pretty doll that can be styled a million different ways. Although many people will have ‘the same face,’ they will not look exactly like you your doll. Like the popular Bloom dolls or the Doll Coco awhile back, people will wear this but still have the option to go back to “their shape” any time. In addition to the included Makeup HUD, there are 3 more HUDs available for purchase as an add-on. If you want even more Blush, Lipstick, or Eyeshadows, you’ll definitely want to pick up these too. I expected the Chloe Hybrid Mesh Head to be quite pricey, but it’s cheaper than most skin fatpacks. The package which includes all five skin tones, a Makeup HUD, and all body extras, is on sale for $2499L. 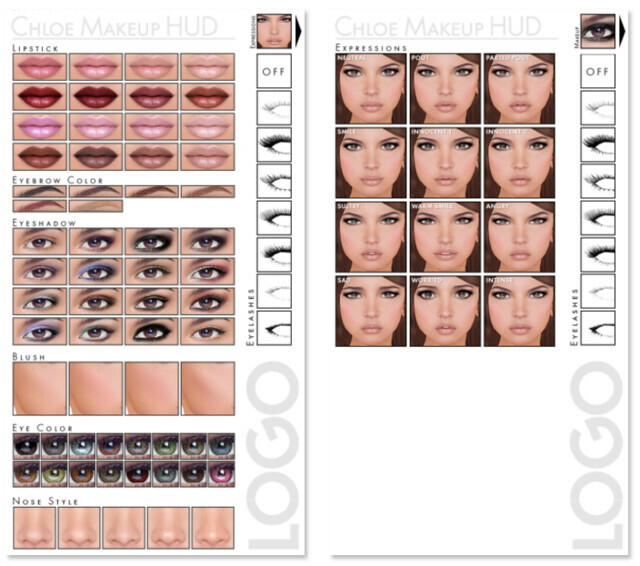 If you wanted even more makeup options, the add-on eyeshadow HUD is $249L and the blush add-on HUD is $99L. You can wear the Logo Shape included with the mesh head or wear your own body shape, like I have above. To wear your own shape, just make sure you copy your body numbers to the Logo shape, but pay attention to the neck area, make sure you’re not changing body fat too much otherwise it won’t fit perfectly. The neck width, and neck length can be adjusted to accommodate a new head size as well. The mesh head size can be re-sized by changing your shape’s head size. Visit LOGO to check out Chloe! Did you guys try Chloe? Do you love it? How do you feel about wearable Mesh Heads? Well, LOGO just forever put herself on the SL Map! Yay, I love her products! Beautiful and an excellent sign of things to come (hopefully), roll on a perfect full mesh avatar. I found the head a little too big, not a lot, but a bit……probably me doing something wrong. Still, I love it !!. Never seen this blog before, now going to be a regular visitor for sure. Gorgeous! I really, really like the facial expressions and to have all those make-up options is awesome. I prefer to have my own face exactly how I want it. I still refuse to wear much mesh clothing for the fact that I came on SL from IMVU because SL had better customization of avatars. SL has slid back in time instead of being innovative because IMVU always been mesh bodies, mesh hair, mesh clothing, mesh shoes. mesh everything. Sorry, but putting SL mesh on par with IMVU mesh is like saying Lamborghinis and Kias are “same” because they both feature airbags. They might both feature heavy usage of mesh but there is a WORLD of difference. Not all mesh products in SL are jaw-dropping fantastic, but I think it’s safe to say that most mesh items you’ll find in SL would run circles around anything you could get in IMVU. what would be awesome is if you could send logo a picture of yourself in real life and she could make your face into mesh. that would be spooky as hell but so cool. Actually I read an article in New World Notes where someone can do just that, I don’t think it comes with quite the same range of options as this product does..but its your face on a mesh head. wow. i’m officially spooked now lol. that’s really cool. thanks for the info. Wow, I’m speechless!! What a gorgeous face. yes! let’s be twins/triplets/quintupletssss x infinity! Very impressed with the demo, can’t quite afford the full thing yet, blah. Now if I could only get my mesh slink hands to match the skin inluded , don’t suppose you could help out? I bought this and I agree that the face is absolutley gorgeous! And I say this as a skin designer myself, it is very well made. But it has a few flaws, the eyes look kinda weird against the inner corner, it’s not a huge thing, but I am very picky. >.< And since the teeth and eyes are linked together, you can't use a different set of eyes if you want your teeth showing, I'd love to see options to just wear the teeth instead of teeth/eye-combination. Also I wasn't a huge fan of the actual body, but I got a pretty good match with one of my skins, so I could just use the head. I ended up buying it and was pleasantly surprised when I unpacked everything that there were alot more ways to customize your look than you are expecting! It comes with 2 tummies and a bunch of nippy tattoos to make your look even more unique. I am not saying that IMVU and SL is the same. IMVU is not on the same level as SL and never will be. I am just saying that the concept of mesh is the same to where you have to conform to standard sizing and whatever the mesh creators decide is beautiful. Eventually when there are enough mesh creators that develop mesh heads and perhaps when the mesh deformer comes out then SL will regain its sense of uniqueness it had before mesh. I have to agree with this, don’t get me wrong there are alot of nice mesh creations out there so far, and this head is pretty however I feel mesh has turned half the population into clones with the same shapes. Sadly all of the standard sizes are never even that voluptous or curvey for my tastes and all sim to be very slender/stick like especially the legs. I cherish the thick, curvey shape I’ve had since day one of being inworld and refuse to change it or even tweak it a little just to fit into some standard sizing mesh outfit because it ends up making me feel not so unique anymore and looking like the rest of the female sl population. Pingback: OFF WITH HER HEAD.. « What *IS* Willis Talking About? I tried it and really liked it but I couldn’t get over having such large lips. If they later add a hud to change lip size then I will seriously consider it. I bought it! I can say I am in love with Chloe. But there is just one thing that will make my sl life difficult when wearing chloe head – lack of hair bases:/ If there is nt hair base to wear I can not wear my beloved updos hair styles. So thats the only “minus” of it. Hope LOGO will update Chloe with hairbases too, then I will be 100% happy. I totally agree. Lack of hair bases is troublesome! So cute! It’s awesome how you were able to still make her look like ‘you’. i bought it….and i love it…i use my own shape…and cleveage….and the skin matches mine perfectly…alabaster. i bought all the add ons…and with the mesh slink hands, and mait….feet…i love the look….i am not a designer…so i don’t mind the lil flaws in the eyes…etc..cause we in real life are not perfectly made and have flaws….sl just keeps changing….and i love mesh…it is just another evaulution of the internet chat that is second life….a fashionesta…. The shapes are modified. Change what you need to change. Actually, you cannot modify the anything from the neck up — aka the whole mesh head, cos it is what it is. You can only re-size, not manipulate the features in any way. Anyone find a work around for the feet problem? This is really making this not pleasant to use. Every time I to I have to take off the eyes and shoes and put them back on. I have to agree with most Ladies in here: LOVE the face it is absolutely gorgeous from start to finish. Still I really love to toy around with my face all the time. I usually make 2-3 shapes for every skin that I get because thats just me. So with this one Id love to know if they will sell the skin minus the head, as well? The cleave of style 3 is just amazing, just what ive been looking for, for a long time. also the belly and the collar bones. The other skins in the store unfortunately dont have that, even tho theyre stunning, too. I just dont really need the head so to speak. It would be a waste because its so beautiful and I know I wouldnt use it often enough to do it justice. SL Skin won’t be as detailed, ever. Think I’ll add this to my list of things I wont buy in SL. Very pretty face, but I don’t see the need for a mesh head. I love my avi’s face and spend a lot of time trying not to look like every other avatar. On this picture : http://www.flickr.com/photos/gogolita/8095343794/ it’s the shape supply with the LOGO folder or it’s Juicy shape ? Ty ..
hi Adeline, that is the Logo head — the head cannot be ‘shaped’ in any way, except for re-size. Thank you for your reply, that sure that jaw don’t change a little the face? Its a pretty face, I just wish the eyes weren’t so incredibly big. I’d also like the demo to have the body fat 16 head as well. The body fat 0 looked too angular and sharp for me and my frame, so its hard for me to judge. A hairbase option in the huds would definitely be something I hope to see in future releases. It’s weird i tried yesterday this mesh face and i don’t have same result my head is really less large than your and the nose look like a triangle. It’s like the demo version is not the same as your version. I was so reluctant to go and try a mesh head because I would not like to have to same face as everybody else has but omg, I am in the store now trying the demo and I so loved the face. I still don’t know if I will buy it or not because I am attached to my own face but I like the work. Tried this one the other day, awesome HUD, love the fast change and options, however, the eyes do look way too perfect (whites too white) just wish they looked a bit more realistic, gorgeous look otherwise. The head size does not change the face shape, I promise! A lot of people think this, but the demo IS what it is, if there’s a difference between what you’re seeing and what’s in other people’s photos, it’s cos of camera angles & style choices. Love it on you but don’t like the teeth. They look like a white line to me but ADORE the facial poses. Love love love it! I am very picky and was so bored with all my skins as beautiful as they are. Chloe is so pretty. I just love the makeups and eyebrows & lip colors. I love the body – the cleavage on style 3 is amazing and someone asked me if I wore Lolas. I usually tweak my face shape daily and I thought for that reason I would’nt be happy with the mesh head but now I have all the makeup options to play with which I love. Also suprised to see all the nipp and stomach and bum options! Love the expressions. Would like to see additional face shapes along with eye, nose and lips sizes and also would be nice to link the huds and be able to minimize them. congratz to the creator! Chloe is beautiful and so well done and comes with so many options. I’m checking daily for the Sadie release!! It seriously must be just me, as the feedback I have seen so far for this is very positive….but I tried the demo in the hopes of my avi looking like the example for the Amber skin (I think she looks so absolutely beautiful), but found it looked nothing like it. I went through and added everything in the demo…shape,skin etc, tried different nose shading and expressions etc, but no luck. I love the concept…though like others have said, am concerned about being a clone. The example is so beautiful I probably would have pushed those concerns aside if I could have mimicked that look though. I felt that the way the demo turned out for me was very unattractive with too large eyes, nose and lips and a rather narrow/gaunt looking face. The word that comes to mind is Ratface lol. I appreciate the amount of work that must have gone into the head though. Whenever anyone mentions Mesh avatars, the issue of looking like everyone else always comes up, due to their inherent lack of slider-based customisation (at least for now). In a way, the only drawback I can see with this product (which I’m loving by the way) is that it costs too little. At L$2499, it’s pretty accessible. Just the makeup, eyes, and expressions alone make it SO much more than a decent skin / shape one can find at a similar price. If I was the creator, I’d make it start at L$9999. Why? Well, that’s one way to sell exclusivity, and reduce the potential of running into too many people that look just like you – which seems to be a pretty big concern. Also, I’d suggest they make it limited edition (e.g. Only 500 will be sold – ever). I know that sounds like limiting your market, and maybe it would. But at the higher price, it might work to deal with the big perceived weakness. It would also probably create a massive rush to buy the product, in order to be in the first 500. Personally, while I don’t see it being an major issue – especially since I see such differences with only hair and angle changes – I’d happy pay a premium price for the exclusivity of having something only 500 other people in SL have. Given that I’ve easily spent 10K for skins and shapes that over the past 2 years, this just makes sense doesn’t it? Whic brown hair does she wear on the last pictures? why doesn’t the line outlining the lower part of her face (chin/jaw) continue cleanly? it disappears in a couple of places, giving the uneven/jagged jawline of the old classic avatars! and the elongated eyes seen in a few pics above are VERY unnatural…in most of the pics above, her face is too chubby on the bottom for my liking.